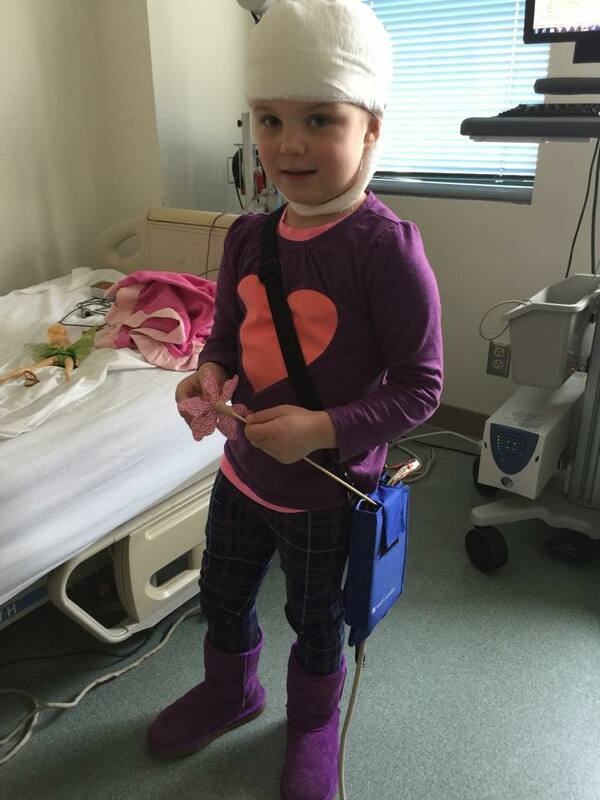 When Ailbe was 18 months old (as many of you know) she was diagnosed with Infantile Spasms. 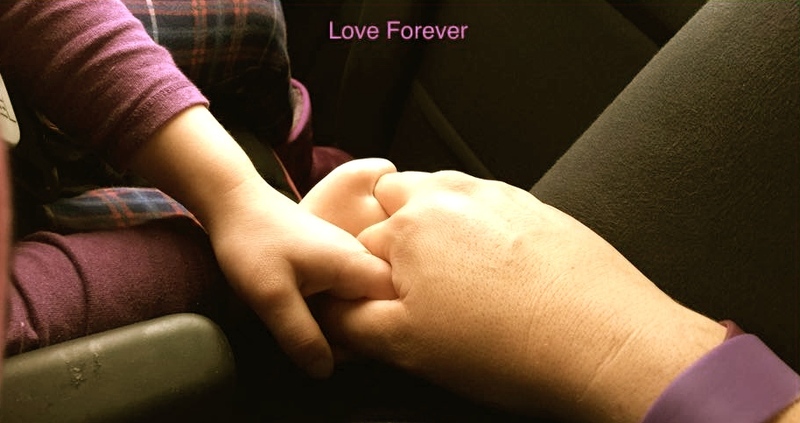 We were told to grieve the life we had planned for her and to accept that our child wouldn’t be able to accomplish developmental milestones like her peers. Specifically to talk, care for herself, compete athletically, understand life, feel and express emotions and basically that our Ailbe was not “our” Ailbe any longer. We tried five different medications prednisone, keppra, zonegran, vigabitrin, topamax, the ketogenic diet, surgical consults, endless therapies and nutritional supplements along the way and eventually we found Sabril. Now Sabril has many serious side effects, including permanent damage to your peripheral vision, and those patients under this form of treatment are required to have routine eye exams and electroretnograms every 3 months but that aside, the effects of spasms on a child’s brain are far worse than potentially losing your peripheral vision. Ailbe has been on Sabril for almost two years now, with no vision damage that we have found or can see and has been seizure free since June 19th of 2013. A month ago we had a VEEG test done and yesterday we FINALLY received the results. 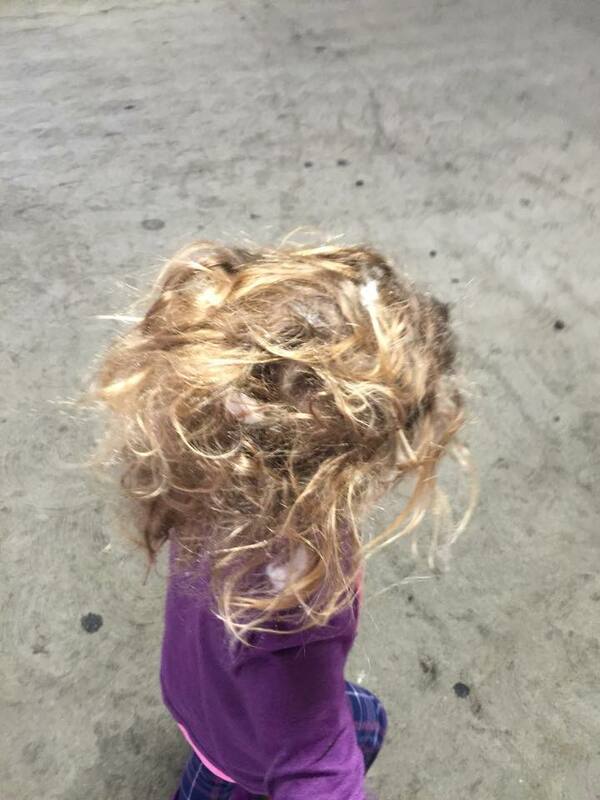 Imagine waiting a month to find out what lay ahead for your child and her future. Imagine waiting over two years, each and every day fearing that your child was dying, fearing that she would never recover and that life was forever changed, with constant negative results, bad situations and devastating evaluations of your child’s capabilities, to finally receive some POSITIVE news that in your heart you believed would always come. For me, that reality came true yesterday. Here’s Ailbe with her leads already placed on. The process was much easier than being in the hospital and I was able to lay with her the entire time. Praise God for chocolate chips and Tinkerbell as they both helped us lay long enough for placement. The test was four hours long but she was able to move around. They said that it was crucial to view her brain function while asleep and I was even able to make that happen! I couldn’t believe I got her to sleep in a random outpatient office! They placed us between two sleep studies which turned out to be the only negative part to the day. A technician frequently entered and asked us to “keep it down.” Our response “ya, okay.” I mean seriously? Yes, they were serious! 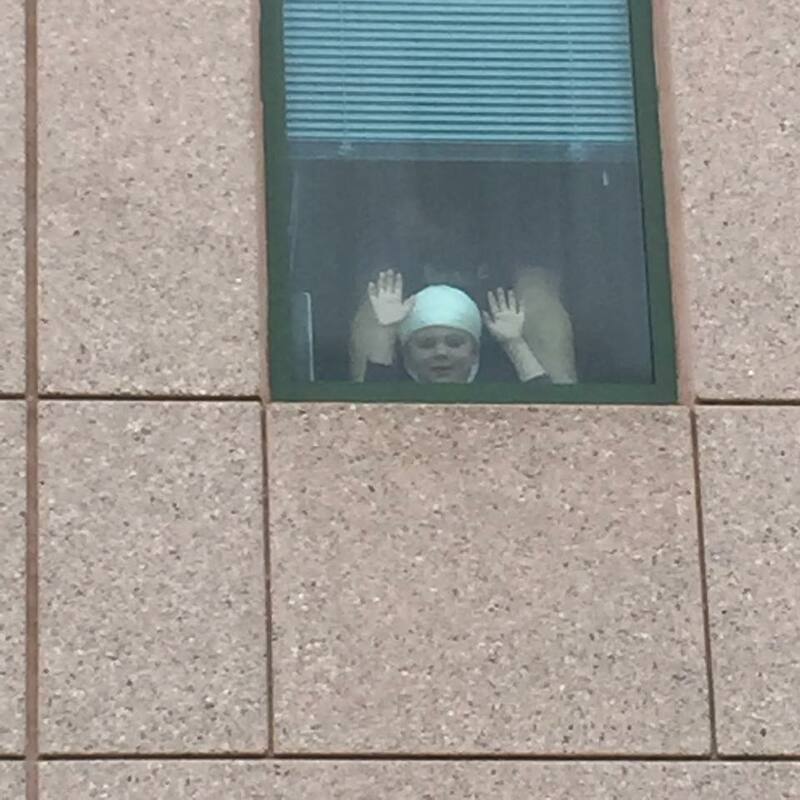 Here’s Ailbe getting to move around, and waiving at mama and baby outside. My sweet girl is SUCH a good sport, she was happy and didn’t fuss. 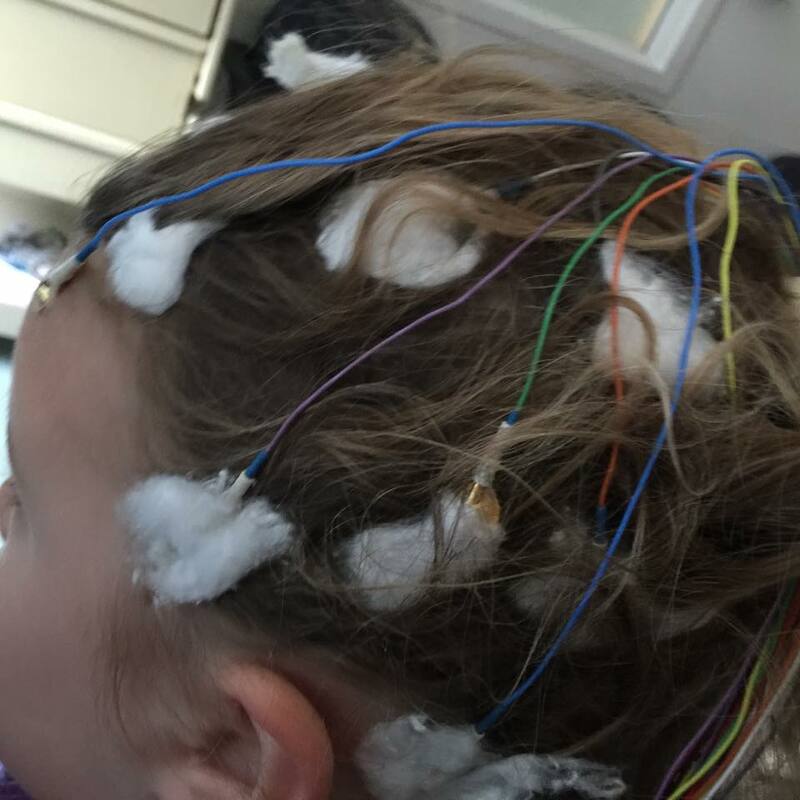 Here is a picture of her snoozing and her awesome after EEG hair! When the test was done the waiting began and yesterday we finally met with our neurologist. He told us that Ailbe had a relatively good EEG. 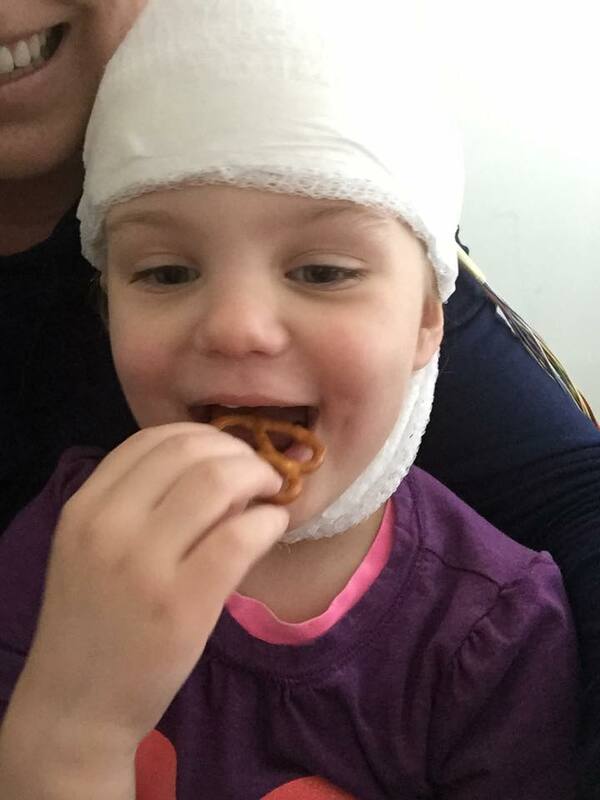 She did have some small spiking in the frontal right lobe which was to be expected from a child with Cortical Dysplasia but NO seizure activity. 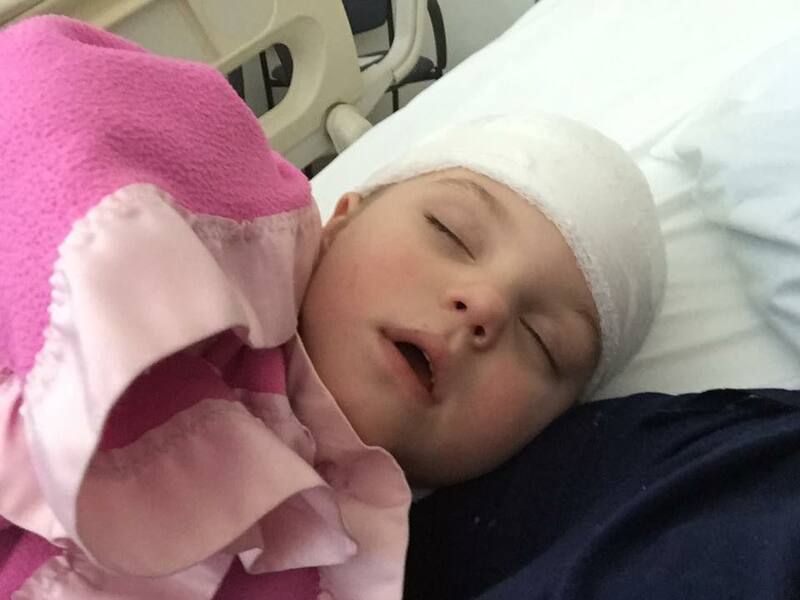 CD is the birth defect that is believed to have been the cause of Ailbe’s Infantile Spasms and cannot change because that part of her brain cannot grow back, it is forever in that state. Her brain can compensate around her “defect” and she could live a “normal” life with significant work. The doctor went on to tell us that he felt confident that the spasms would not be returning. Could they? Yes, but it was not likely with them being gone for this length of time. He advised that we begin to wean the sabril (a 6 week process) and that we would stay on topamax for a while longer. Johnathan and I both asked a variety of questions. Our most important was if the neurosurgeon told us that Sabril had a 3% chance of working the last time the spasms came back and it did, then are we taking too big of a chance by weaning. His quick, and comfortable response was “no.” He said that most likely if Ailbe did develop seizures again (although she could never have them again, wouldn’t that be incredible!) they would be focal seizures and that focal seizures have around 20 medications that can control them and they are much easier to treat than spasms. He did seem very casual, and confident. Our neurologist always errs on the side of caution and doesn’t casually suggest things, he takes Ailbe’s life and her prognosis very seriously. For some reason I took his comments casually myself. I was able to listen and digest what he was telling us without panicking or overthinking. It was like I was having some sort of epiphany that this too was the right time, and my gut also agree. My mama gut has never let me down along this road. He just kept saying that she was doing “really well.” Which, was super reassuring. So without too much thought, I’ve had several years to think, we started the wean. I’m not sure what to expect but hopeful that it’s all happening at the right time. To date here are some of the things that Ailbe can do! She can use 275 words functionally, can request things she needs, is potty trained, can brush her own teeth, can put on her own shoes, can take her clothes off, can build a tower of 10 blocks, can complete 4 piece puzzles, can match one to one correspondence, can take a 3D object and match with it’s 2D mirror, can feed herself, can “clean up”, can swim without aide, can “wash” herself, can hug and kiss, can identify all her family members, can says the letters in her name, can recite A-G of the alphabet, can sing the Happy Birthday song, can dance, can jump, can ride a bike, can kick and throw a ball, can clap, can sing and motion “head shoulders knees and toes,” can identify blue, pink and purple colors, can count to three, can identify general body parts, can open apps on an iPad, can blow bubbles, can sign various words, can feel and show remorse by signing and saying “sorry”, can pretend play with tea sets, dolls and kitchen toys, can understand “gentle” and uses “awe” when hugging baby, can climb, can run, can sit for several minutes while learning, can watch movies and react to funny/sad emotions, can color, can draw straight lines, can zip and unzip bags, and most importantly can absolutely melt your heart with one smile and her contagious laugh. Bee is our inspiration, and so are YOU super strong mama! Great work. So in awe of you! AMAZING news! We are so happy for you and the entire family! Go BEE!!!!!! Next Next post: Miracles do happen!